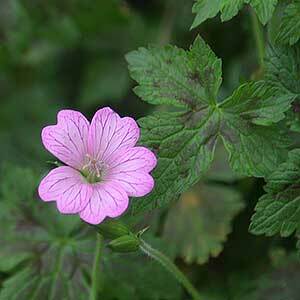 Geranium x oxonianum are elegant, easy to grow and with some wonderful varieties provide flowers that are long lasting. Many also have great patterned foliage, green with a brown to deep red variegation. These tough drought tolerant plants will flower from spring right through until the end of summer, longer in warmer climates. They make great ground cover plants, and will self seed, although are not weedy. Excellent in a cottage garden, great fillers in the garden border or grow one of the outstanding varieties such as ‘Lace Time’ in a container for a great display. These are very easy care plants. Once established they require only a little fertiliser or some added compost around the plant each spring. Easy to tidy up with secateurs if needed. Choose a position in full sun to part afternoon shade. Prepare a humus rich and well drained soil. Plant and water in with a liquid seaweed fertiliser or similar. Water during long dry periods. Most varieties will reach around 40 cm in height with a similar spread. ‘Southcombe Double’ – Rare pink double flowering variety This is a G. oxianum thurstonianum hybrid. ‘Walters Gift’ – Pictured above. Claridge Duce’ Pink flowers ribbed with mauve, very attractive. Katherine Adele’ – Pink flowers with foliage that is variegated green and brown. ‘Wargrave Pink’ – Silvery salmon pink flowers and very hardy.